For all the soup lovers, this Beef Bulalo Recipe is a must! Bulalo or Beef Shank Soup can be very expensive in some classy restaurants, but if you take time to learn and follow this simple bulalo recipe I have prepared for you you'll be surprised how easy it is to prepare this original and savory Filipino dish! 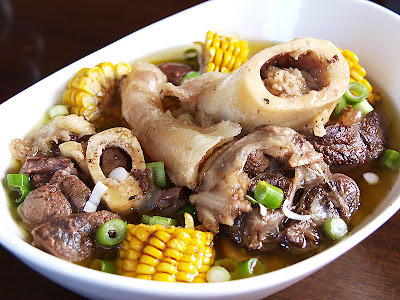 Here is my beef bulalo recipe for you to follow. Try it and let me know what you think. SEE MORE FILIPINO BEEF RECIPES! Have you tried this Bulalo Recipe yet? For suggestions, cooking tips, and new recipes, feel free to write it in the comments section below. I'd say about 3-5 persons. Bulalo is my favorite! I really miss home as well as the Filipino food. I will make Bulalo this weekend after work. I am craving a lot and I can't wait.